The global smart bullet market is heavily influenced by the increase in the defense budget across the world. The swiftly advancing economies, such as China, India, France, the U.S., and U.K. are increasingly integrating smart bullets in their military organizations, which is reflecting positively on this market. With technological advancements, these bullets are likely to witness a substantial rise in their demand in several countries, such as the U.S., China, and India over the next few years. The global market is likely to proliferate significantly in the near future. Expanding at a CAGR of 15.20% between 2017 and 2025, the opportunity in this market is estimated to increase from US$270.4 mn in 2016 to a value of US$955.4 mn by the end of 2025. On the basis of the geography, the worldwide market for smart bullets has been categorized into North America, Latin America, the Middle East and Africa, Asia Pacific, and Europe. North America, closely followed by Europe, led the global market in 2016 with a share of more than 42%. This regional market is projected to retain its dominance in the near future, thanks to the increase in the defense budget and the rising demand for weapons. Technological advancements are also expected to stimulate the uptake of these bullets in this region over the forthcoming years. Europe is another important market for smart bullets. It is driven by the augmenting demand for smart weapons in the U.K, Germany, France, and Russia. The U.K. has emerged as the leading domestic market for smart bullets in Europe. Among other regional markets, Asia Pacific, is likely to report a higher growth rate between 2017 and 2025. Several economies in this region, such as India, Australia, Japan, South Korea, and China are anticipated to present promising opportunities for the growth of this market in the years to come, thanks to the ongoing research activities for the development of highly advanced smart weapons. Apart from this, the rising demand for weapons and frequent terror attacks are also anticipated to drive the Asia Pacific market for smart bullets in the next few years. China has surfaced as the key domestic market for smart bullets in Asia Pacific and is projected to remain so in the near future. Smart bullets find significant usage in airborne, land, and naval weapons. The land segment emerged as the leading end user for smart bullets in 2016 with a share of 43.6%. Researchers anticipate the scenario to remain so over the forthcoming years, thanks to the increasing investments in the military and defense sector for the development of smart weapons in developing economies. Over the next few years, the presence of war-like situations in various countries, such as Turkey, Ukraine, Lebanon, China, India, France, Afghanistan, and Pakistan, is likely to increase the overall demand for smart bullets, reflecting positively on this market. The airborne segment is also projected to report a significant rise in the demand for smart bullets in the near future, owing to the high investments in remote sensing and sensors for defense from the Brazilian army. Lockheed Martin Corp., The Raytheon Co., Thales Group, BAE Systems Plc, General Dynamics Corp., Northrop Grumman Corp., Harris Corp., Boeing Co., Taser International Inc., and Textron Defense Systems are some of the key players in the global smart bullets market. A smart bullet not only follows the route of the target but also sends data, changes its speed, and turns according to it. Smart bullets exhibit various features such as better lethality with aim point range. They are also effective against moving targets. Increase in the demand of smart bullets in several developing countries such as India, China, Brazil and Argentina among others is expected to boost the market during the forecast period. The smart bullets market is dominated by North America due to the focus of the U.S. government for the incorporation of the technologically advanced weapons to its weapon list. In addition, the U.S. government is also the major customer of smart bullets in both global as well as North America. One of the major factor fueling the market for the smart bullets is increase in the budget of defense in several countries such as China, India, France, U.S. and U.K. among others. In February 2017, U.S. government boosted their defense spending by approx. USD 54 Million. This budget will help the law enforcement to keep the terrorists out of the country. In February 2017, Indian government announced to increase their defense budget by 6.2%. This budget includes to buy new equipment, aircrafts, weapons, army vehicles and naval warships among others. In March 2017, Chinese government announced to boost the military spending by 7% which in turn boost the market for the smart bullets in the coming years in Asia Pacific as well as globally. This will help the country to be a step closer to become the supreme power globally. Guided smart bullets and self-guided smart bullets are the various product types of the smart bullets market. In 2016, guided smart bullets market is estimated to be the largest market followed by self-guided smart bullets market and expected to be the same during the forecast period of 2017 – 2025. Increase in the criminal activities is one of the major factor fueling the market for smart bullets in some of the major countries such as the U.S. among others during the forecast period. The smart bullets market has been segmented on the basis of end user into naval, land and airborne. In 2016, land segment in smart bullets market is estimated to be the largest market followed by naval segment and expected to be the same during the forecast period of 2017 – 2025. Increasing economies in the Asia Pacific region to invest significantly in smart weapons for military is one of the major factor driving the market for the land segment in smart bullets market. In addition, Wars in various countries such as Turkey, Ukraine, Lebanon, China, India, France, Afghanistan and Pakistan among others is major factor boosting the demand of smart bullets during the forecast period of 2017 - 2025. 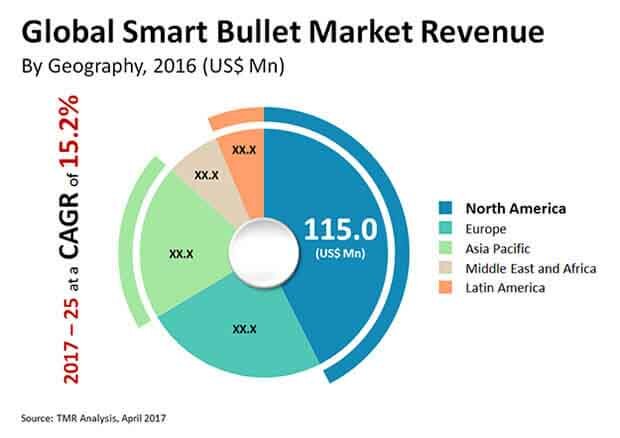 North America, Asia Pacific, Europe, Middle East and Africa, and Latin America are the various geography type of the smart bullets market. In 2016, North America held the major share of the market, followed by Europe, Asia Pacific, Middle East & Africa and Latin America and anticipated to be the same in the coming years. Increase in the investment in defense is one of the major factor driving the market for smart bullets during the forecast period. Demand for airborne smart bullets is one of the major factor fueling the market for smart bullets during the forecast period of 2017 - 2025. The major company in the global smart bullets market are Lockheed Martin Corporation (United States), The Raytheon Company (United States), BAE Systems PLC. (United States), General Dynamics Corporation (United States), Thales Group (France), Northrop Grumman Corporation (United States), Harris Corporation (United States), Boeing Company (United States), Taser International, Inc. (United States) and Textron Defense Systems (United States).